JUNIOR GIRLS Name: Katherine Schuster Hometown: Kill Devil Hills, N.C. Affiliation: Pointe Golf Club 2018 Accomplishments: Katherine Schuster captured her first Carolinas Junior Girls' Player of the Year award after a year that was headlined by winning the National Champi- onship (Girls 14-15) at the Drive, Chip & Putt at Augusta National. 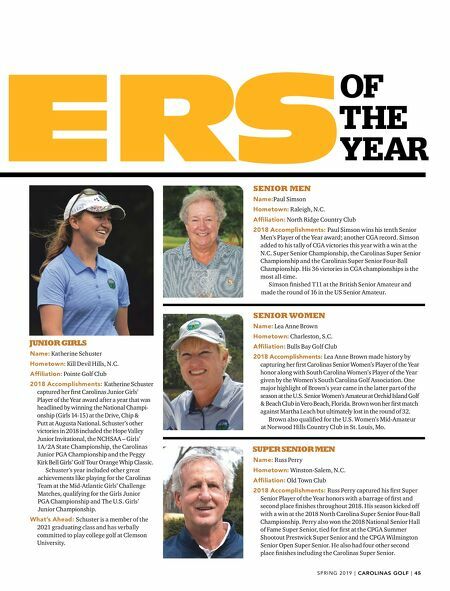 Schuster's other victories in 2018 included the Hope Valley Junior Invitational, the NCHSAA – Girls' 1A/2A State Championship, the Carolinas Junior PGA Championship and the Peggy Kirk Bell Girls' Golf Tour Orange Whip Classic. 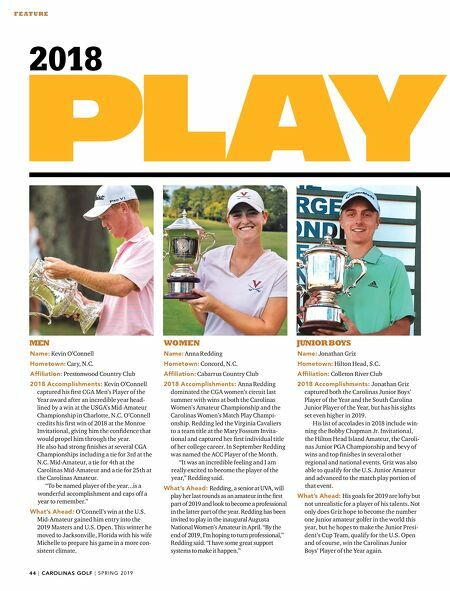 Schuster's year included other great achievements like playing for the Carolinas Team at the Mid-Atlantic Girls' Challenge Matches, qualifying for the Girls Junior PGA Championship and The U.S. Girls' Junior Championship. What's Ahead: Schuster is a member of the 2021 graduating class and has verbally committed to play college golf at Clemson University. S P R I N G 2 0 1 9 | | 45 OF THE YEAR SUPER SENIOR MEN Name: Russ Perry Hometown: Winston-Salem, N.C. Affiliation: Old Town Club 2018 Accomplishments: Russ Perry captured his first Super Senior Player of the Year honors with a barrage of first and second place finishes throughout 2018. His season kicked off with a win at the 2018 North Carolina Super Senior Four-Ball Championship. Perry also won the 2018 National Senior Hall of Fame Super Senior, tied for first at the CPGA Summer Shootout Prestwick Super Senior and the CPGA Wilmington Senior Open Super Senior. He also had four other second place finishes including the Carolinas Super Senior. SENIOR MEN Name: Paul Simson Hometown: Raleigh, N.C. Affiliation: North Ridge Country Club 2018 Accomplishments: Paul Simson wins his tenth Senior Men's Player of the Year award; another CGA record. Simson added to his tally of CGA victories this year with a win at the N.C. Super Senior Championship, the Carolinas Super Senior Championship and the Carolinas Super Senior Four-Ball Championship. His 36 victories in CGA championships is the most all-time. Simson finished T11 at the British Senior Amateur and made the round of 16 in the US Senior Amateur. SENIOR WOMEN Name: Lea Anne Brown Hometown: Charleston, S.C. Affiliation: Bulls Bay Golf Club 2018 Accomplishments: Lea Anne Brown made history by capturing her first Carolinas Senior Women's Player of the Year honor along with South Carolina Women's Player of the Year given by the Women's South Carolina Golf Association. One major highlight of Brown's year came in the latter part of the season at the U.S. Senior Women's Amateur at Orchid Island Golf & Beach Club in Vero Beach, Florida. Brown won her first match against Martha Leach but ultimately lost in the round of 32. Brown also qualified for the U.S. Women's Mid-Amateur at Norwood Hills Country Club in St. Louis, Mo.